Mount Baker Adult Crew (MBAC), housed at Mount Baker Rowing and Sailing Center, is an open access program, offering fitness, fun, and competition. Adult or “Masters” rowing is open to everyone 16 and older. At MBAC, we offer multiple ways for you to get involved depending on your level of experience and interest. Our classes range from Learn to Row to Competitive Rowing and can be taken at various times and days of the week. We have a competitive crew racing men’s, women’s and mixed boats in the major regional regattas in the Spring and Fall. We work hard, race full out and have fun. Those rowers who prefer not to race work out alongside those that do and have access to the same great coaching as the racers. Many of them are accomplished rowers with decades of experience who just prefer a bit more of a laid back approach and they are just as much a fabric of the boathouse as the racers. We row early (5:30 AM), mid-morning (9:15 AM) and early evening (6:00 PM). Not sure what rowing is all about yet? Come to our FREE Introduction to Rowing session to find out! Click here for more information and to view the schedule. This two-hour FREE introduction class is for those curious about the sport of rowing. Find Learn to Rowout what the excitement is all about. You will be introduced to the techniques and terminology of rowing and even have the opportunity to get in a boat and take a few strokes on the water. This two-hour class is strictly an introduction to this fast growing sport known for its physical fitness and teamwork. Ages 12 and up! 12-15 year olds must be accompanied by an adult. Year round Junior Crew courses and information can be found here. This 18 hour course is the first of our four month “Learn to Row’ program. This first course is designed for those who have no rowing experience. We will introduce the fundamental stroke, terminology on and off the water and much more. The beginning of the course will be spent learning the language of rowing, strengthening your core (torso/ trunk muscles that support and stabilize your movements) which is essential to rowing successfully, and developing the technical base on our rowing simulators aka “ergometers.” After which, the class will move to dockside rowing and then to the water. A solid base of rowing is essential to the health of the participant’s future rowing endeavors. “Learn to Row – Level 1A” or equivalent from another rowing center is required. We also suggest this course to those rowers who took a brief or extended hiatus from rowing. This course will continue to build upon the knowledge and skills learned from Level 1A. Sculling will be introduced and encouraged. We will develop a fitness routine that specifically increases the aerobic base of the participants as well as the core (torso/trunk muscles that support and stabilize your movements). This course will continue to increase the overall knowledge and technical skills on the water for the sport of rowing. Learn to Row – Level 1A and 1B or equivalent skill base is required as a prerequisite. Rowing 2A and 2B are the third and fourth courses in our “Learn to Row” series. These courses provides the time on the water and on the rowing simulators to continue to develop the many layers of rowing well. We also will continue to develop boat handling and increase the physical fitness of each participant to a higher level. You will learn more advanced rowing technique and how to use your strength and power more efficiently while rowing. Both sweep and sculling technique will be taught. 1A, 1B, 2A & 2B Rowing courses required or equivalent as prerequisite. Join this course to continue to develop your rowing skills, increase your aerobic capacity, and improve your overall fitness level. Sweep and sculling will be encouraged by staff. Safety, coxing and equipment care should be second nature upon enrollment to this course. Fun and fitness on the water is the priority. 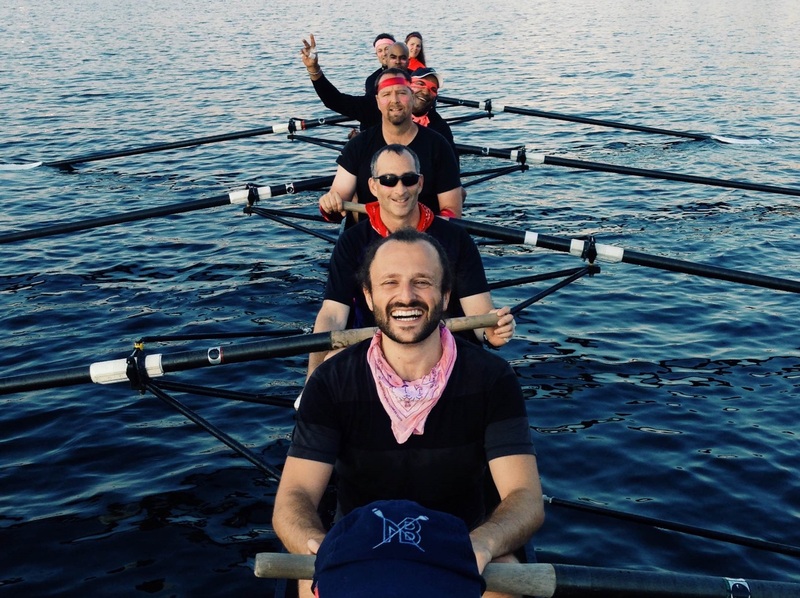 Rowers at Level 4 are part of a team of men and women who race locally, nationally, and even internationally at such regattas as Opening Day/Windermere Cup, Northwest Regionals Championships, Canadian Masters Championships, and the Head of the Charles. Competitors have the opportunity to race in both scull and sweep boats, as well as in mens, womens, and mixed boats. The team practices four days a week. During the rowing season — March to November — crews practice on the water as much as possible. Coaches provide extra land workouts for athletes to maintain top fitness. In the “off” season, the team is on the water on Saturdays (weather permitting). During the week, winter conditioning sessions consist of workouts on ergometers, core and stretching, and weekly yoga. Level 4 fosters an atmosphere of camaraderie and friendship, while training and competing at the highest possible level. Prerequisites: Rowing Level 3 or equivalent is required. Athletes must be able to perform the basic stroke in sweep and sculling, and demonstrate proper boat handling, boat safety and coxing. Level 2B or equivalent rowing experience is required for these off-season on-land workouts and Saturday morning rowing. This is a great way to stay in shape for the upcoming season. Activities will include erging, calisthenics, stretching and weightlifting.